So this was not a memoir about alcoholism, let me get that out of the way. When a book is about a childhood and early adult hood spent in a bar, you expect it to be about substance abuse (also, the description on the cover said it was the best book of its kind since Mary Karr's "The Liar's Club," which was about alcoholism). 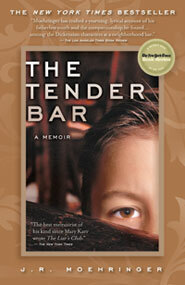 But "The Tender Bar" is actually about masculinity and how a boy learns to be a man. The author, J.R. Moehringer, was raised by a single mother and had to cobble together father figures from the men at his local Manhasset, Long Island bar, Publicans. The various uncles and neighbors and friends who showed him how to be a good man--and in many cases, how not to be a bad man--are vividly portrayed with both humor and pathos. I didn't learn anything about the masculine identity I didn't already know (as a woman, I already know far too much about the male ego, what makes it tick, and what makes it dangerous, as I discussed in my review of "Wide Sargasso Sea"), but it was a nice change of pace from the kinds of books that I usually read, and a reminder that white males who go to Yale are humans, too. The star of this work isn't the narrator, though, or the men he gathers around himself to emulate. Publicans is the true subject of "The Tender Bar." The book is as much a history of the bar and the honored place it held in the community as it is about J.R. Moehringer, and I really enjoyed that aspect of the story. The bar, as an active character in the book, was the beating heart of Manhasset, a real public house where everyone, men, women, and children, could go and be welcomed with food, drink, and company. Publicans provided a safe place for the author during the rough times in his life, and also provided a compass for the decisions he had to make as he stumbled toward adulthood, and it's heavily implied that he was only one of many who needed the bar in this way. Continuing my theme of books that didn't go where I thought they would, the fact that this book wasn't about alcoholism says a lot about how I expect drinking narratives to go. I don't know if it's my latent Temperance Society woman coming out (I'm not going to say my latent Puritan, because they drank like fish), but I do feel weirdly guilty that I expected the author to turn into a wretched drunk who had to reject the bar in order to get sober and live a truly meaningful life. The life he led in Publicans was deeply meaningful, and overall the relationship he had with the bar was a healthy one. This is a rare memoir about a drinking life that isn't about substance abuse. And he ends the book by realizing that all of the things that make a good man were right in front of him the whole time, embodied in his mother, so take that, patriarchy! Final Grade: B. Recommended for fans of memoirs, stories about boys and their fathers, and the people you meet in bars.